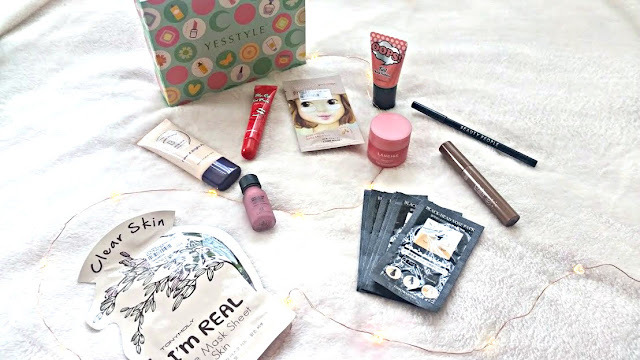 Korean Beauty has taken the world over by storm, with its cute packaging and fuss free products whats not to love? Lisa Eldridge is a huge fan and every time I watch one of her korean beauty inspired videos, I am desperate to try the products out. 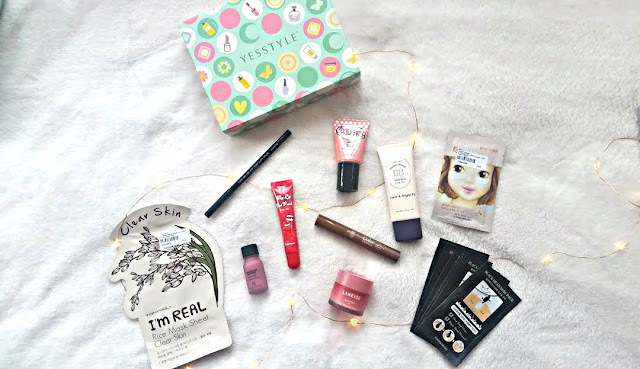 YesStyle kindly gifted me one of their Korean Beauty Boxes* and as soon as it arrived everything was applied, smelt and used! YesStyle is a online store that stocks everything from Korean clothing to beauty products, your one stop shop for everything Korean inspired. Inside this beauty box, there are 10 items to try out and all of them are full sized products, which many subscription services don't offer. The box retails for £16.05, this is a random box but there are also others specific to brands and categories. These pieces are the ones that I got very excited about! 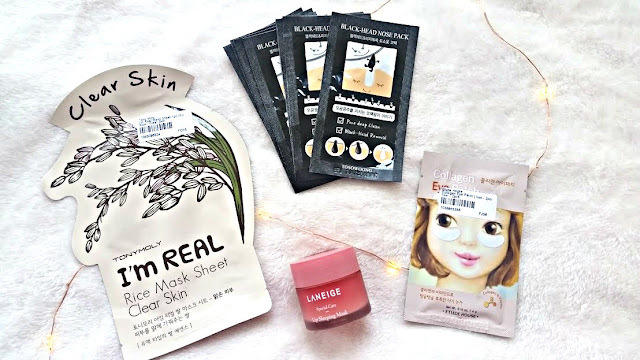 The first thing I spotted was the Tony Moly I'm Real Rice Sheet Mask, a brand that is raved about in the beauty world and who's sheet masks are meant to be better than the rest. Its a 3 layer sheet that has been designed with natural oils to brighten the skin and it smells so fresh too! I applied this right before I went on holiday and my skin looked glowy and fresh. Similarly, the Etude House Collagen Eye Patches helped recover my under eye circles from the weeks of no sleep and the cooling sensation of them and the mask on my face, put me to sleep for a good half an hours oops! Watching the 'Trying out Weird Beauty Products' videos on YouTube are so odd yet very satisfying. One product that comes up often is the blackhead nose strips and the ones from Tosowoong are just that. You apply the sheet on to you nose and the powerful ingredients inside work wonders to extract all the blackheads and leaves your nose clean and bump free. These are very strong and the slow rip to take them off feels like the slowest thing in the world, but my pores and blackheads looked so much better after. It amazes me that the Laneige Lip Sleeping Mask alone is the price of the whole box! This is one of YesStyle's best sellers and so it should be, my lips have never felt or looked so good. Its not a lip plumping mask but a lip recovery mask - making it perfect for the winter months. Applying a small amount at night works wonders, waking up the next day with soft lips and no dry patches! Starting with one of favourite products from the whole box, the Etude House BB Cream. Its a gorgeous lightweight and blendable formula that sits so well on the skin. Its a bit too light for me to use all over the face, but on those no makeup, makeup days I've loved using it as a quick base. It covers imperfections and brightens the skin. The Oops Tint Cheek Cushion is a product I've ended up packing in my suitcase last minute because of the gorgeous creamy, blendable formula and stunning pink colour. Never have I used a cushion to apply blush but this was super easy to use and glided on to my skin. 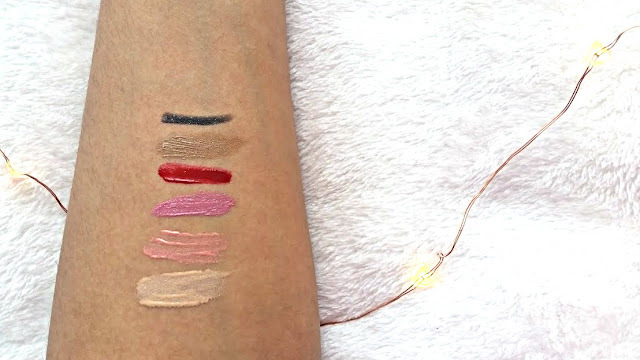 The Macqueen Lip Tint is a multi-purpose product, it comes with a dofer applicator and can be used either on the lips or cheeks. On the lips it isn't drying and gives you a lovely tint to the lips that isn't drying, I tried my best to use on my cheeks but didn't find it as blendable as the cheek cushion. But I am always one to try, its a great product to travel with or keep with for on the go. The Berrisom Lip Tint is another famous Korean product, its a way to keep the colour on your lips for longer without having to top it up. You start by applying lip balm to your lips as base and then take this gel like tint and apply it all over for around 10 minutes to dry. Then, slowly you peel it away and are left with a colour on your lips that should last for 12 hours. Mine is in the shade Vivid Scarlet a gorgeous deep red . Its a very weird product and not what you expect at all but it actually works! After peeling it off, my lips were left with this red colour on them and it lasted me the whole day! I think I need the other shades in my life! Finally, we have the eye makeup products. The first is a brow product from Etude House, its a highly pigmented brow product that for me adds a bit more definition to my brows which are already pretty dark. The other product is the 10 Second Auto Eye Pencil, it twists up to give you a product that will last forever and it dries in only ten seconds. Its odd because its a gel formula in a pencil form? Odd yet amazing and the other end is a pull out sharpener so you are never stuck without your eyeliner! 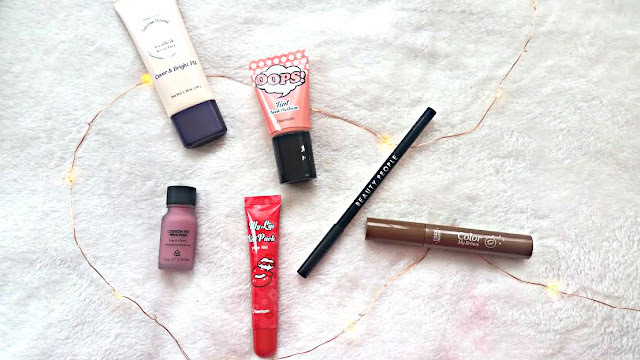 Overall, I am in LOVE with all these Korean beauty products. There's nothing like the original stars and if you get a chance to visit the YesStyle website have a look at there #YesStyleTop10 and try one of the amazing products. Have you tried any K-Beauty products? !